This is a Text not a Video. Due to commitments on home front and paucity of time it is becoming difficult to make videos of all known items. If I have to make a video only before I’m to share these, it is likely to take considerable time. Meanwhile there is also an urge to share what I know for the benefit of my viewers. 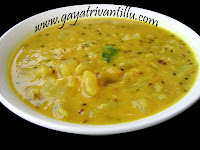 These items are prepared, perfected and enjoyed at my home. 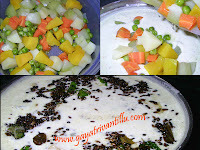 Hence they too carry the same commitment and conviction as in recipe videos, while I share them with you. As and when these text items are converted into videos, the above photo would be replaced with its video. Enjoy!!! Here I have taken a glass bottle of 50ml capacity to make the candles. Take a wick holding button. Take sufficient wick to fit into the glass jar. Pass the wick through the button and tie one or two knots to fix the position. Apply little gum to the bottom of the button and insert the wick with button into the glass jar and press lightly to fix it. Keep this aside for few seconds for the button to stick in the jar. Place a stick or toothpick horizontally on the mouth of the glass jar and wrap the wick on the stick to make it stand vertically in the jar. Take a wide mouthed bowl and add water to it. Heat this water on low flame. Take a small bowl and take 50gms of gel wax into it. With the help of tongs hold the small bowl and place it in the hot water to melt wax using double boiler method. Stir the wax with a spoon till it melts completely. 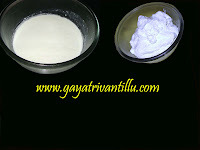 Once wax is completely melted add a pinch of color and 10 drops of aromatic perfume and mix well. 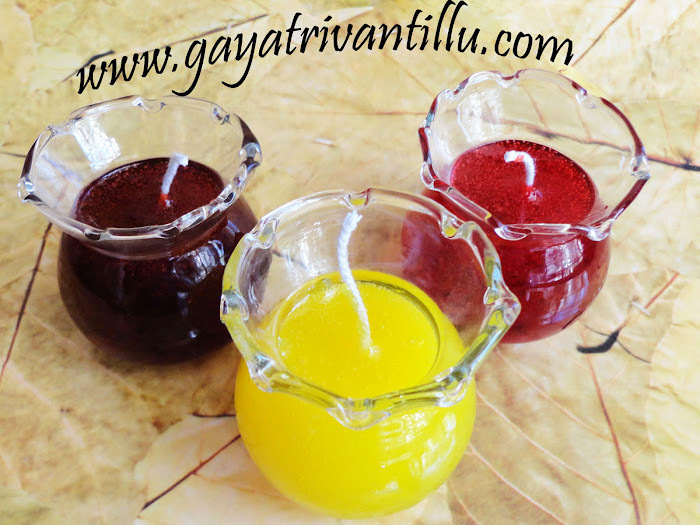 If wax appears to transform into gel while mixing color and perfume, place it in hot water and mix well. Once everything is mixed well, pour the prepared gel wax into the prepared glass jar carefully----It takes 20 to 30 minutes to set. Once set, wrap the mouth of the prepared candle with cling film and store till use. 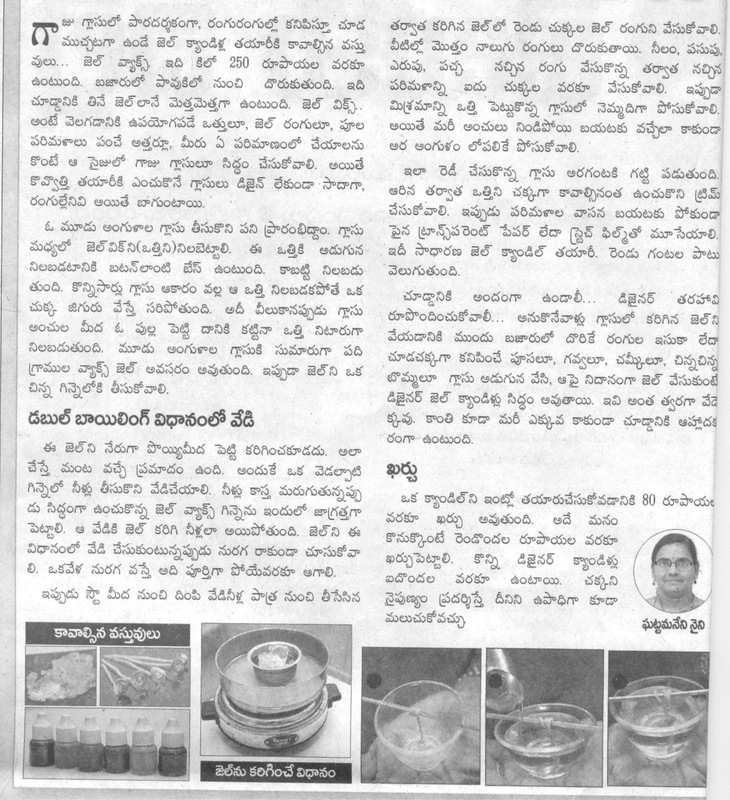 On January 24, 2013, I read an article in EENADU VASUNDHARA by Ms. Gattamaneni Naini on how to make aromatic gel candles at home. Inspired by the article, I immediately bought the required things and made three candles in three different flavors (Mogra, Jasmine and Rose). Generally all the required material would be available in one store only. Only during winters, when there is no need to switch on the fans, we enjoy candle light dinner with the loved one. Why one dinner? These candles cost only a fraction of what we would have otherwise paid in the Malls. Make them at home and have many many colorful dinners! !